The Aubin Abrasive Blaster line is specifically manufactured for the economical finishing of small parts. The unit is designed to use any flowable media down to 100 grit, including glass bead and other cutting and polishing media. As a result, this rugged unit can be used to achieve a broad range of finishes, from matte to bright, in a wide range of deburring, polishing, etching and cleaning applications. In fact, you will find that the finishing requirements of many types of small parts, such as jewelry, electronic components and fine instruments, come together in the flexibility and efficiency of this versatile unit. is designed for use at pressures up to 125 psi. has replaceable, non-clogging tips lined with ceramic or carbide sleeves for long, continuous use. 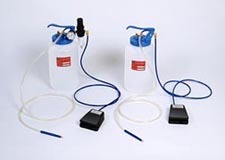 has handpiece attached to abrasive canister with 5' flexible hose. controls abrasive flow by thumb screw and is activated by convenient foot switch. uses non-pressurized container which is a convenient gallon size that holds about 15 lbs. of most commonly-used abrasives. has threaded cover constructed of plastic-coated cast aluminum fitted with a handle for easy portability. The ABFR models come complete with regulator, filter, and pressure gauge. The AB model has no filter, regulator, or gauge (for use with filtered air supply).